With all the news about next week's solar eclipse, I was thinking about why we always see the same side of the moon. 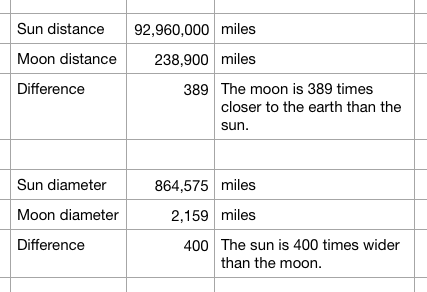 The answer is simply because the time it takes the moon to orbit the earth is the same amount of time it takes to rotate on its axis (about 27 days). Why does the moon nearly perfectly block out the sun during a solar eclipse? 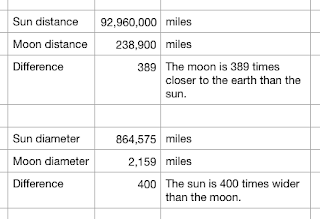 My conclusion, after running some calculations, is that the sun is 400x wider than the moon but it's also nearly 400x farther away. Feel free to peer review my calculations.